Kyle and Owen’s birthday is a big deal. In a lot of ways. I’ve never really written about it before in any depth (I touched on it in this post), and I think that is because for me it is so personal and sensitive and intimate. It is hard to write publicly about certain topics. The bigness of their birthday is one of them. 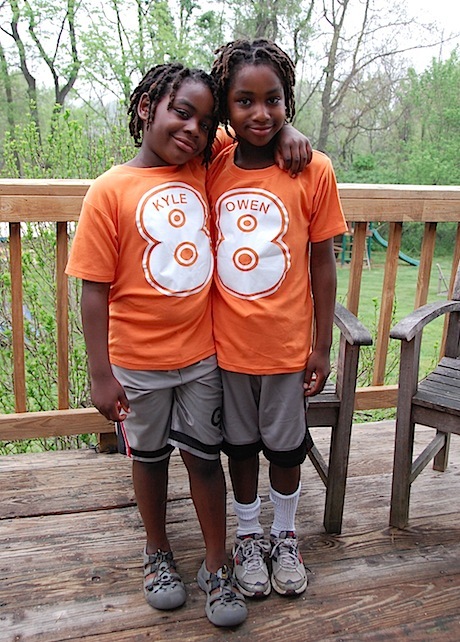 We adopted Kyle and Owen in January 2005. It was a huge adjustment to go from being a childless, career-focused, super social couple to being the parents of twin 8-month-old babies. And we had a lot of adoption-related stuff layered on top of that: health and healing, attachment and bonding, and all of the emotions that come with becoming a newly adoptive family. The first few months were grueling and intense. By the time their first birthday rolled around we had only had them for 3.5 months, but it felt like a lifetime of experience had transpired. 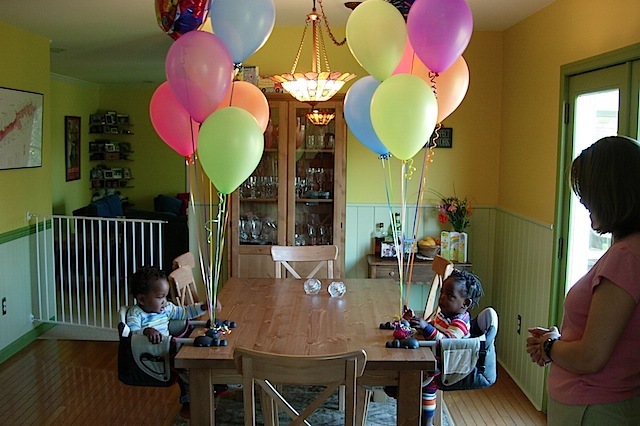 May 8th, 2005 was their 1st birthday. It was also Mother’s Day that year. And it was the day that we chose for Kyle and Owen’s baptism. Oh my God, it was a huge day. Looking back on it, I see myself as a blurry-eyed brand new mother who was in the midst of running a mothering-marathon (and knew that I had gotten through the toughest uphill stretch, but was only at about Mile 10 of the race). I loved those baby boys so much. My heart was exploding (I often felt like I was going to combust from pure love). I cared for those baby boys so much. My brain was exploding (I was reading baby books, medical books, adoption books, twin books, inter-racial family books and desperately trying to learn to do black hair). I felt for those baby boys so much. My soul was exploding (I would sometimes, late at night after they were both asleep, just fall apart in convulsive sobbing tears just crumpled up in Braydon’s arms, unable to articulate my thoughts and feelings about their life-experience-to-date). 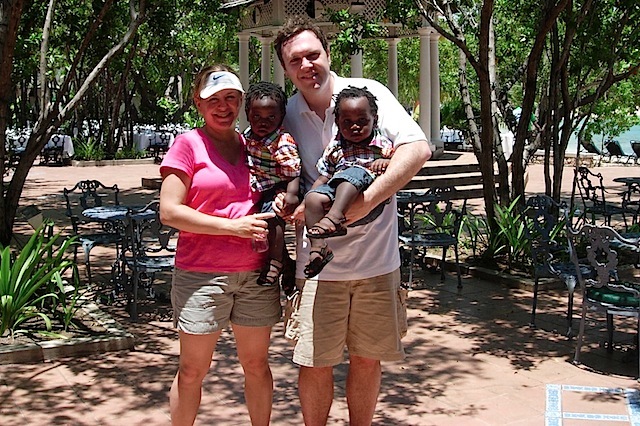 I felt very much alone and isolated in it (we knew positively nobody who had ever adopted baby twins from a Haitian orphanage, and it mostly felt like nobody we knew really had any clue about what we were going through). It was overwhelming. And somehow, for me, it all came together around their first birthday. It was a trigger for me. And I think I sort of fell over the edge a little bit. 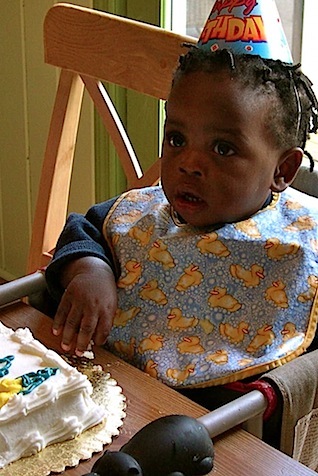 I spent their first birthday a weepy, crumpled mess trying hard to put up a good front for the boys and everyone else. I went through the motions of that day — their first birthday, my first Mother’s Day, their baptism — and I might have put on a good show. But behind the scenes I was a wreck, privately crying my heart out to Braydon, and desperately trying to explain to him — and to myself — why this day was making me so over-the-edge-emotionally-shattered. Mostly, for me, it was about not having been with them for the first months of their lives, and especially about not having been there when they were born. I felt frustrated that I didn’t know any details about their birth, I felt profoundly indebted to — and sad for — their birthmother and them, and I felt a huge set of troubling emotions about the whole entire thing. 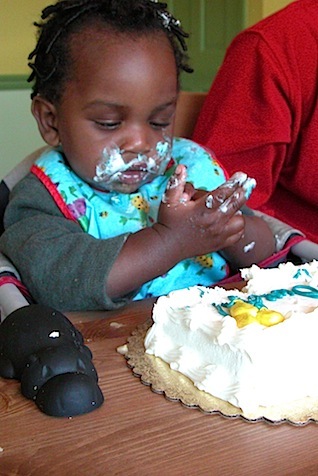 That first birthday triggered a deep sense of grief that had been in me all along, but that I hadn’t yet allowed myself to fully acknowledge. I felt like I couldn’t be grieving loss when I had gained so much; like I couldn’t expose my sadness to people when I finally (after what had felt like a very long and very painful adoption wait) had my boys home; and most of all… like I couldn’t mourn something that I had chosen. The feelings were so strong, though, that no matter how much I didn’t want to deal with it all, I was sort of forced to anyway. Their birthday brought it all undeniably to the surface. I just couldn’t stop weeping. Tears would just stream down my face, regardless of how hard I tried to keep it at bay. I remember spending their first birthday crying. On the other side of that 1st birthday, I resolved to myself to never, ever spend their birthday crying again. I was determined to get to an emotional place where I’d be able to acknowledge and experience the grief and mourning (that I presume most adoptive parents feel at some level), while also being able to truly celebrate their birth. 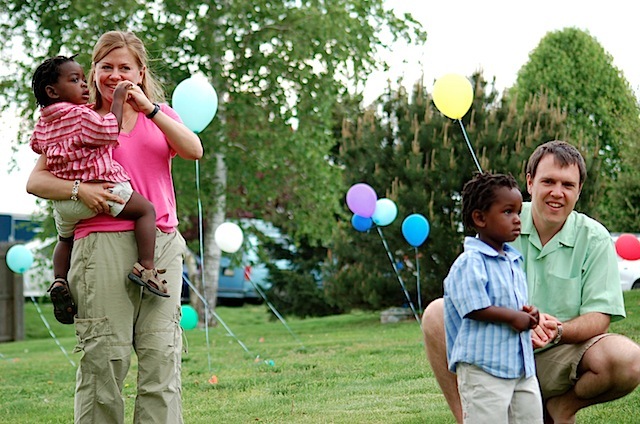 Because the real problem with their first birthday was not so much the profoundly sad emotions, but the fact that those emotions entirely took me over so that I couldn’t allow for the profoundly joyful emotions to be there too. So, the next year, when their 2nd birthday was looming, I planned the biggest celebration I had ever planned (other than my own wedding). We hired a band, bought the biggest birthday cake we could buy, set up our backyard as a full-blown family festival, and invited everyone we knew. Braydon gave a speech that day right before we sang ‘Happy Birthday’ to the boys. He spoke out to all of our family and friends about our indebtedness to K & O’s birthparents and the people in Haiti who had lost so much in making our family possible, about how our boys were fully thriving, and about how grateful we were for all of the people in our lives. We ate, we drank, we danced with K & O to “This Little Light of Mine,” and we partied for our boys’ birthday. 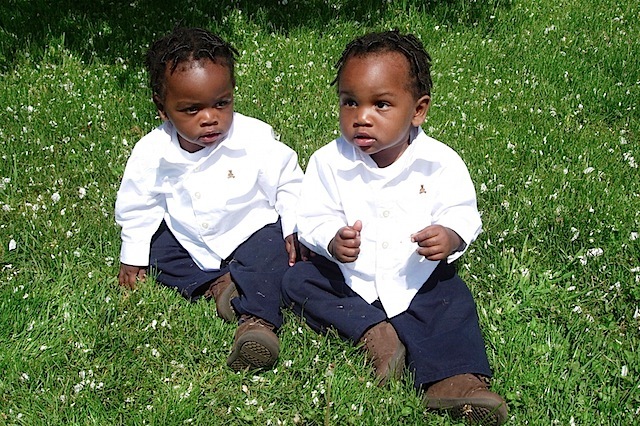 I remember their 2nd birthday as a mix of emotions— with me feeling weepy mournfulness at times, and with me feeling elated joyfulness at times. It felt exactly right. And so our tradition of a big, huge, mega-bash of a party for K & O’s birthday began. And with the exception of last year (click here), we’ve done some version of that every year since. We don’t shy away from the grief and sadness and loss and mourning. But we also don’t shy away from celebrating– big time. Kyle and Owen have come to love their birthday. And I have come to love their birthday too. I absolutely savor every minute of envisioning it, planning it, and making it happen. And for weeks (months?! 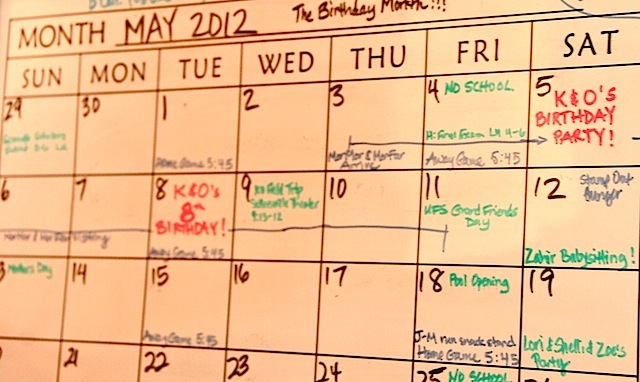 ), we all count the days leading up to the boys’ big birthday bash, and their “actual birthday” on May 8th. Thank you for sharing a bit about Kyle and Owen’s first birthday – I can imagine it is hard having this published and I hope everyone reads it thoughtfully and respectfully and is able to hear the meaning behind it. It really moved me and I can’t say I know what you’re feeling but it really touched me because it most certainly is such a profound early history and I believe it is absolutely right to both grieve the loss an celebrate the gain of adoption – recognising only one aspect would be completely unhelpful for the emotional wellbeing of the child and the family. And it is so hard, and so isolating to bear this – it is so hard to articulate it and to feel like if and when you do someone else may not get it and may respond in a way to diminish it because they cannot grasp it. And also to truly grasp it (to attempt to) it requires us to be content with feeling the unsure, in a state of mixed emotions and so forth and as you say “let them be in me”. I think it is awesome that you go all out for all your children’s birthdays – for it is a day that is solely theirs (and your tradition to honour their birth mother is so beautiful and just the right thing) and the energy and commitment you pour into all the planning, prepping, execution and post-party clean up speaks volumes to the love you have for Kyle and Owen. Well done mama! Oh and I love your line about the mothering marathon – I’m sure many mothers’ can relate! Loved yet AGAIN the birthday bash for K and O, simply amazing! Also enjoyed reading about your emotions that first year, heavy stuff, but oh so important to discuss for us adoptive mom’s. What ever will you do next year w/o the big yard to celebrate?? I was wondering if you could tell me what K & O’s current height and weight is? My Haitian son is only 8 months older than them, but didn’t come home until 6.5 years, so I’m just curious as to how he is doing size wise in respect to your growing boys. Morelson(our son) loves seeing pics of K and O by the way, his grandma lives in PA, so he likes that K and O are close to her! If grandma lives in PA, you all should seriously consider joining us in July for our Haiti-Families-Reunion! Email me if you are interested! hbj2 (at) lehigh (dot) edu. Re: K & O height/weight… it would not be fair to compare Morelson to them because they are way, way, way above average— literally, like 99th percentile on the pediatrician’s charts. 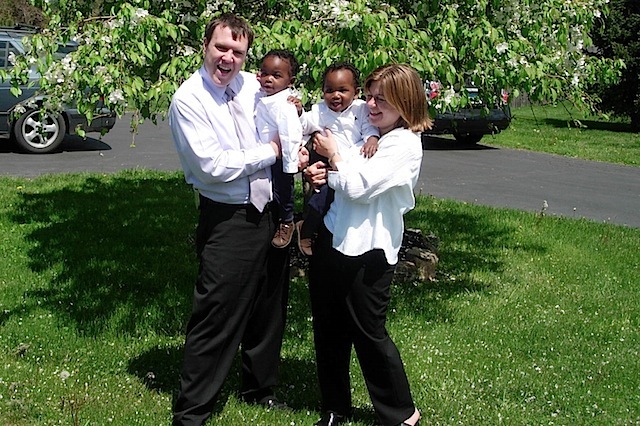 (And FYI: they were both in the bottom 5th percentile when they first came home from Haiti. I’m not sure their height/weight currently, but I know they are wearing size 12 clothes. So fun! I admit I’m a terrible birthday mom. Terrible. We have parties, but I don’t feel as though I celebrate them as much! Way to go you! Happy birthday Kyle and Owen! What is the size difference between the boys? They are becoming easier and easier to tell apart as they get older!